Nausea and vomiting are not uncommon in early pregnancy. 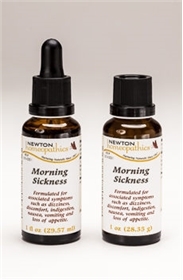 Morning Sickness complex is helpful for relief of these symptoms. Directions: Take 3 to 6 drops on the tongue whenever needed for relief of symptoms. Ingredients: Bismuthum metallicum, Bryonia alba, Gossypium herbaceum, Ipecacuanha, Symphoricarpus racemosus 15x. Hydrastis canadensis, Iris versicolor 3x. Alcohol 20%.